Cepaea nemoralis (also known as the Banded Snail) is the most colourful and variable snail in the UK. It occupies a range of habitats including woodland, grassland, hedgerows and garden shrubs. The most striking feature of this snail is its array of shell colours and banding patterns. They can be yellow, pink or brown and can have up to five horizontal bands across their shells. UK populations of C. nemoralis have been intensively surveyed, particularly between 1950 and 1980. They have been classically used to address key questions in evolutionary biology such as: how is such variability maintained? Populations of C. nemoralis show interesting patterns of local adaptation. 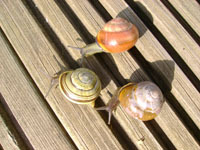 Yellow five-banded snails are more prevalent in grassland habitats and darker unbanded snails are more prevalent in woodland. The consistency of this pattern across hundreds of colonies in the UK, as well as in other European countries, strongly implies that natural selection is playing a role in shaping these populations. Furthermore, these evolutionary patterns occur over short distances in the UK, making C. nemoralis an ideal organism to study. Research suggests that different shell morphs provide cryptic camouflage in different habitats to protect against predators (e.g. the Song Thrush, Turdus ericetorum). This means that dark woodland habitats have more dark (pink and brown) shells than yellow because the yellow shells appear more conspicuous and are therefore more heavily predated. Selection imposed by predators this way is termed 'visual selection'. This model is restricted to regions where the Song Thrush is common, such as south England. The predators are not always found in the species range of C. nemoralis, so other factors must be involved. The climatic selection imposed by different habitats contributes to the pattern of local adaptation. Different shell morphs have different thermal properties. Darker (pink and brown) shells absorb solar radiation more efficiently and are therefore favoured in shaded woodland where light is scarce. Conversely, lighter (yellow) shells will minimize heat absorption when solar radiation is excessive, as in open grassland. When regional morph-frequency data is pooled and compared across Europe - a much broader scale of climatic variation - we see a striking association of yellow shells and hotter climates. These evolutionary patterns are not absolute. As with all natural systems, there are exceptions. Even when a particular morph is markedly more prevalent in a colony, other morphs still persist, albeit at a low frequency. Today, many authors agree that there is no single evolutionary cause for the way C. nemoralis populations are. The variability serves as an inspirational reminder of the complex inter-play between so many factors - a theme so commonly echoed throughout the natural world. Because of the effect climate has on populations of C. nemoralis, changes in morph frequency over time may be indicative of changes in our climate. Therefore, there is enormous potential for this species to be used as an indicator species to monitor climate change. Similarly, in regions where strong visual selection is likely to be operating, changes in morph frequencies of C. nemoralis could be used to monitor declining bird populations. References: Cain AJ, Sheppard PM (1954) Natural selection in Cepaea. Genetics, 39, 89-116. Jones JS, Leith BH, Rawlings P (1977) Polymorphism in Cepaea - Problem with Too Many Solutions? Annual Review of Ecology and Systematics, 8, 109-143. Ozgo M (2005) Cepaea nemoralis (L.) in southeastern Poland: Association of morph frequencies with habitat. Journal of Molluscan Studies, 71, 93-103. Large numbers of broken shells of Cepaea nemoralis (several hundred) were found in sparse woodland at the base of young ash trees. These findings were in association with mammal scrapes and occasional vole runs which suggests that thrushes may not be the only predators taking them. While thrushes may select on the basis of colour morphs nocturnal mammals, if these are infact predating on the snails, will be selecting using other criteria. So far the literature is focused on avian predators. A valuable introduction to local adaptation of Cepaea nemoralis, the selection processes operating on morph frequencies, and the relevance of C. nemoralis as an indicator species – with appropriate referencing. Concisely and well presented.